Making Scents and Finding Your Health Direction - JennScents, Inc. When you get lost, you use a compass to find your way, right? Should you be heading north, south, east, west or a combination of all directions to reach your destination? Well, what about when you need to find direction with your health? What tools do you have at your fingertips to guide you? I want to introduce you to the Solle Compass, one of my favorite tools in my daily “healthbox”. 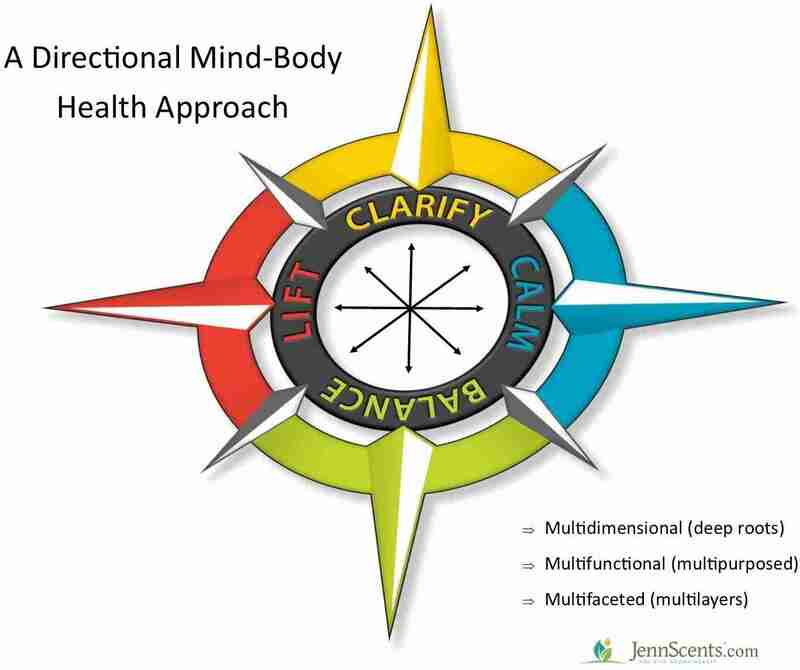 It is a system of Directional Mind-Body Health to help you find your way back to health. Just like the 4 directions on a compass, there are 4 product categories that were carefully selected to support you in one direction or another, or in several of directions at once. The categories are even color coordinated to make it simple. In additional to directional health herbal products, I had the honor of formulating corresponding essential oil blends to enhance, support and nourish the emotional and mental counterparts for each direction. It is health made simple, working together to bring physical, mental and emotional health in balance, simultaneously. Each essential oil blend and herbal formulas have three things in common. They are Multidimensional, meaning they have deeps roots in their power, and help you work on root issues that drive results. They are Multifunctional, or multipurposed, which deliver a plethora of benefits, for simultaneous results across the board – physically, mentally, emotionally, spiritually, nutritionally and environmentally. Lastly, they are Multifaceted, or contain multilayers of modalities (i.e. benefits, phyto-constitution, TCM, scent odor, intensity and viscosity, doctrine of signatures, historical folklore, etc.) to target issues from many directions, using various tools and skills. Green is for BALANCE. It is in the South position which represents the Earth, and green grass. The goal is to bring harmony among your body systems, processes, mind, thoughts and emotions. It’s main focus is mineral replenishment, pain, inflammation and stress management. The scent offers a balancing, floral yet herby citrus-like aroma. Yellow is for the sun, light and to CLARIFY. It is in the North position and brings you up, adds air, breath and oxygen to cells and body systems. The goal is to enhance communication and clarity among cells, body processes, emotions, and thoughts. It’s main focus is to energize, encourage movement, strengthen circulation, focus, concentration, immunity, stamina and endurance (whether physical, mental or emotional). The scent is invigorating, rejuvenating and enervating with aromas of mint-camphor and herbaceous notes. Blue is for CALM waters. It is in the East position and represents calming waters. The goal is to calm overactive emotions, mental chatter, promote sleep, rest, recovery and repair. It’s main focus is to calm anxiety, nervousness, digestive issues, heated issues (anger, hot flashes, pain), skin irritations (itchy) and adrenal fatigue. It’s predominant therapeutic properties are anti-inflammatory, antispasmodic, antifungal, nervine and sedative. The scent is calming, grounding, stabilizing, and nourishing with an earthy-herbal aroma with floral undertones. Red brings the digestive fire to LIFT energy, vigor, digestive functions and blood sugar balance. It is in the West position and stimulates movement. It’s main focus is to awaken the body and mind to provide increased energy, vitality and productivity. The scent offers a spicy-citrus scent with a splash of camphoraceous notes. When you feel lost, and need direction, let Solle be your guide. Message me to learn more about the Solle Compass System or touch base with the person who shared this with you.